Bernard DeVoto (1897–1955) was a historian, critic, editor, professor, political commentator, and conservationist, and above all a writer of comprehensive skill. As a contributor for more than thirty years to Harper’s and other magazines, he was known for his forceful opinions. His essays were often brash and opinionated and kept him in the public limelight. One stinging essay even led the FBI to create a file on him. His five serious novels are forgotten today, but his magazine short stories and the well-paid potboilers that he wrote under a pseudonym (John August) subsidized the first of the significant works of American history that brought DeVoto lasting fame. Four of his historical works, all still in print, are The Year of Decision: 1846, a Book-of-the-Month Club selection in 1943; Across the Wide Missouri, which won the Pulitzer Prize in history in 1948; 1953 National Book Award–winning The Course of Empire; and his popular abridged edition of the Journals of Lewis and Clark, which also appeared in 1953. A busy man with a busy life, DeVoto found time to write and answer letters in abundance. In 1933 he received a fan letter from Katharine Sterne, a young woman hospitalized with tuberculosis; his reply touched off an extraordinary eleven-year correspondence. Sterne had graduated with honors from Wellesley College in 1928 and had served as an assistant art critic at the New York Times before her illness. Despite her enforced invalidism she maintained an active intellectual life. 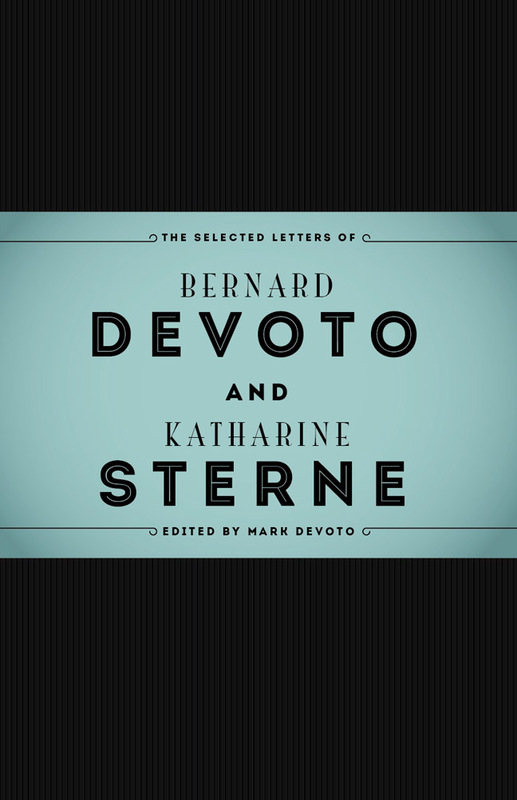 Sterne and DeVoto wrote to each other until her death in 1944, sometimes in many pages and as often as twice a week, exchanging opinions about life, literature, art, current events, family news, gossip, and their innermost feelings. DeVoto’s biographer, Wallace Stegner, states that in these letters DeVoto “expressed himself more intimately than in any other writings.” Although their correspondence amounted to more than 868 letters (and is virtually complete on both sides), DeVoto and Sterne never met, both of them doubtless realizing that physical remoteness permitted a psychological proximity that was deeply nourishing. This volume contains 140 of their letters. They have been selected by DeVoto’s son Mark, who has also provided detailed notes clarifying ambiguities and obscure references. Readers will enjoy these letters for their wit and literary flair, but they will also gain insight into the cultural and historical crosscurrents of the 1930s and ’40s while taking an intimate and engaging look at a friendship forged entirely through words. Mark DeVoto, a son of Bernard and Avis DeVoto, is professor emeritus of music at Tufts University and a staff writer for the Boston Musical Intelligencer, with numerous publications in analysis of nineteenth- and twentieth-century music to his credit. “These letters give a wonderful portrait of their time—from the immediate pre–World War II years through the early part of that conflict. They also give the reader an intimate look at a very special literary friendship, one which allowed DeVoto and Sterne a unique freedom of expression. This is a significant contribution to American intellectual history.”—Carl Brandt, Brandt & Hochman Literary Agents, Inc.